Founded by Alexander the Great in 331 BC, Alexandria is a port city on the Egyptian Mediterranean coast, once an ancient center of learning. 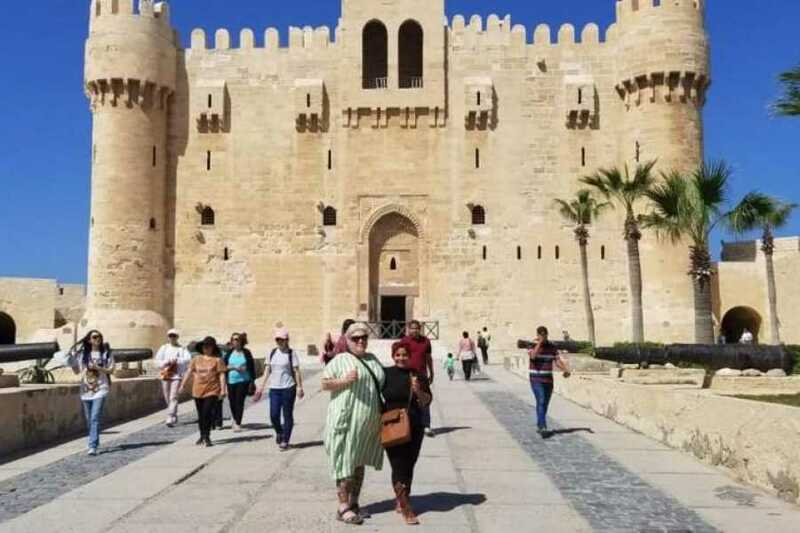 Skip the hassle of arranging your own transportation and get an in-depth peek at the storied seaside city on this convenient day tour from Cairo or Giza, which covers ruins, such as the Roman Theater, as well as the 21st-century Bibliotheca Alexandrina. Few tourists in Egypt venture to Alexandria, a legendary port city on the Mediterranean coast founded by Alexander the Great. During this convenient day tour with hotel transfer from Cairo or Giza, discover under-the-radar attractions of one of antiquity’s most prosperous cities, once known for its massive library, which held 500,000 books, and the Pharos of Alexandria, the most famous lighthouse of the ancient world. Those sights now only exist in legend, but you’ll get a chance to explore other ancient ruins that have remained standing, such as the Roman Theater, and medieval marvels, including the Catacombs of Kom El-Shoqafa. After a tasty lunch in a local restaurant, see the modern Bibliotheca Alexandrina, a library built to commemorate Alexandria’s ancient center of knowledge. Take a stroll along the Corniche, a historic waterfront promenade, before private transfer back to your hotel.